Today we want to share with you a very special metaphor about the meaning of Christmas as told by Thomas Kinkade – the famous “Painter of Light”. This is a perfect story to share on Christmas Day as you gather together with family and friends to celebrate when “eternity entered time, permanently changing both”. Imagine Christmas as a pool in the stream of time. The autumn current flows cold and clear, but as it rushes and chatters around a long November bend, it falls into deep December. Just beyond the pool, the stream hurries on, tumbling into rapids and racing into the channel of a new year. But at the pool, we may (if we wish it so) find a moment’s quiet. Green in the long light of a winter afternoon, bottomless blue on a frosty morning, or mirroring the cold fire of stars in the stillness of a December night, the pool speaks of mysteries beyond our years and invites us to pause and ponder. We don’t have to hurry through Christmas. With a little forethought, with a little discipline, we can make time to take time. We can stop running long enough to listen to the music, savor the lights, delight in the moment, remember the good days of seasons past, and think about enduring things — even as the stream of time glides on by. There is something timeless about Christmas. Perhaps it’s because of the way it came to us. On a given day, in a given place, at a given moment, Eternity entered into Time, permanently changing both. Timelessness intersected the temporal. Everlasting life — enduring light! — pierced a closed system of darkness and sorrow, rendering it closed no more forever. Heaven sent its best to earth, and He came to dwell among us. Into time, through time, and at the right time. A birth. A Baby. A Boy. And then a Man. Pondering Christmas won’t give us any more time, but gazing into the depthless pool just might help time stand still, if only for a season. We might give ourselves to pursuits long overlooked in our preoccupation with deadlines, schedules, obligations, and incessant busyness. Love of neighbors and friends. Love of strangers along the path. And the love of the One who came and gave so much more than we could begin to imagine. This entry was posted in Holidays and tagged Christmas, Christmas Day, December, Holiday, Merry Christmas, November, Opinion, The Christmas Pool, Thomas Kinkade. Bookmark the permalink. 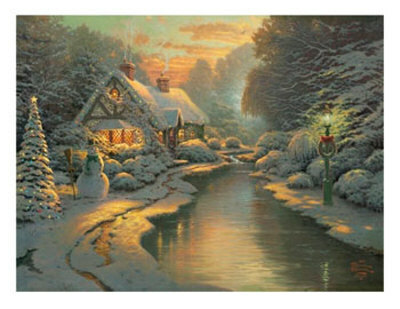 Tom – I know Kinkade’s art work, but have never seen this story. Thanks!